A feature to celebrate the wide range of talents that help to keep alive the sounds and experiences of the 60s. on over 1,000 hit recordings including Billy Fury’s Halfway To Paradise. 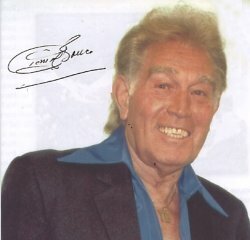 Vince Eager, in whose band he played in for two months before joining Marty Wilde’s Wildcats. His illustrious career continued when he became guitarist for Tom Jones for years, before joining James Last for 15 years. comment: "What a bloody awful row." I had seen Chet Atkins use one and asked Eric if I could have a go. I did and Jack asked me to use it during the solo of Hold Me. It was the first time one had been used on an English-produced record. would it would be perfect for the Crying Game and the producer agreed. he made in the following five years. the Billy Fury LP, We Want Billy Fury LP and the Sound of Fury LP. In his teenage days in Grantham, Lincolnshire, Roy Taylor teamed up with two pals to form the Harmonica Vagabonds, later to be the Vagabonds Skiffle Group. 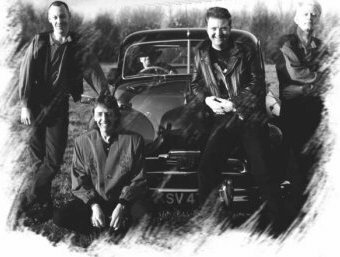 Roy became infatuated with skiffle king Lonnie Donegan's music and the Vagabonds became the local teenage flavour of the decade as they filled the Grantham and district dance halls and clubs with their music and contagious personalities. The Vagabonds were to spread their wings when they entered the World Skiffle Championships, which saw them reach the televised final on BBC Television's Come Dancing. A disappointing second place did not deter the boys and they were offered a residency at the 2 Is Coffee Bar in London's West End. It was not long before they were booked by pop Svengali Larry Parnes, manager of Tommy Steele and Marty Wilde, for a Sunday concert. The outcome was for Roy Taylor to become Vince Eager. This was followed by a tour and the making of an extended play record, Vince Eager and The Vagabonds. Roy Clark and Mick Fretwell returned to Grantham and bass player Brian Liquorice Locking remained in London in search of his personal fame which he found as a member of Cliff Richard's backing group, The Shadows. Vince became a household name with over 100 TV appearances on shows such as Six Five Special, Oh Boy and Drumbeat. 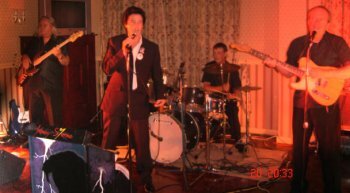 He became a good friend and flatmate of Billy Fury, and has become a valued supporter of billyfury.com, headlining at Fury Fest 03 in Newark. 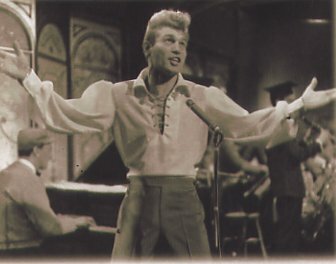 While his recording career was dogged by the conflict that was to develop between him and Larry Parnes, Vince did release 14 singles and 5 albums. 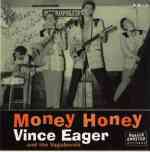 Many of today's compilation CDs feature Vince's 1959-61 recordings. Touring with Eddie Cochran, Gene Vincent, Marty Wilde, Jerry Lee Lewis, Billy Fury and many more top pop names gave Vince the opportunity to hone the stage skills that serve him to this day. 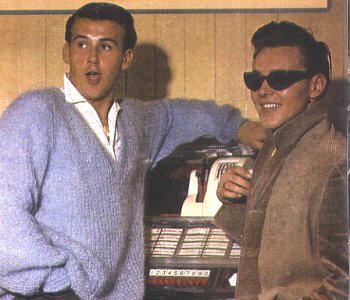 The death of his best friend Eddie Cochran in a car crash on Easter Sunday 1960 was to prove a turning point in Vince's career. He was disgusted with the manner in which Parnes sought to gain publicity from the accident and he began the process of getting away from the Parnes stable of popsters. In the years that followed the Parnes era, Vince was prolific on the British and overseas cabaret circuit, theatre, pantomime and for 5 years he starred in the Sir Laurence Olivier Award-winning West End musical Elvis. In 1986 Vince took up residency in Fort Lauderdale, Florida when, for 12 years, he became a cruise director on luxury American cruise ships. With his wife Anette, Vince is now based in rural Nottinghamshire close to his two sons Simon and Christie and their families. He remains an outstanding performer with a commanding stage presence and an amazing vocal talent. This is Vince's own selection of songs and commentary. While compiling the following selection I suddenly realised that the titles would indicate a religious theme. Whether this is a result of my subconscious taking me back to my youth as a choirboy I wouldn’t know. But I do know they are all songs I love performing live. The Lonnie Donegan interpretation of this was the first version I sang in 1956. This recording I made in 1963 with Joe Brown on drums and his late lovely wife Vickie on backing vocals. It was also this recording, which received the highest critical acclaim of all my records. This was always my strongest song on stage and it was my performance of it on the opening night of the Eddie Cochran and Gene Vincent tour in 1960 that prompted Eddie to come to my dressing room in the interval and congratulate me. I would make myself cry when singing it and it worked a treat. On one occasion during my season with Billy at the Britannia Pier, Great Yarmouth, I had to sing it four times as the audience wouldn’t let me carry on with my next number. It was Billy’s suggestion that I record it as a single but Larry wouldn’t let me. Billy said if I didn’t then he would. The rest is history as they say. No I didn't forget the lyrics. I was told when I started my career that if you change some of the lyrics around in a song you could claim royalties as the arranger......it's only now that I forget the lyrics! Eddie Cochran’s version of this is brilliant and I love performing it. I think my band Rockola do a fantastic job on backing me on this track. This number, and Suspicious Minds, were my two favourite songs when I toured the world as the mature Elvis in Elvis The Musical for five years. I couldn’t resist doing it when I produced Happy Birthday Elvis for the BBC in 2005, using a 40-piece orchestra, an eighty-piece male voice choir and a 40-piece ladies' choir. It was one of the highlights of my 50 years as an entertainer. And finally...number 1 at last! My keyboard player Chris Bucknall produces compilation CDs for the Japanese disco market. I would occasionally lay down vocals for him and they would be released under strange names for Japanese discos. This one was as El Vincent and it reached number 1 in the Japanese disco charts. Sad but true! Apologies to any Elvis fans. It's manic! It tires me out just listening to it! Rob began his career in front of the microphone in the mid-90s, when after a false start as a would-be guitarist, he realised that his singing was earning more attention. He took the plunge by entering the pub and club circuit, where he was spotted by agent Clive Wilce. Clive booked him into increasingly attractive venues, where Rob concentrated on a set of 50s and 60s standards. "I always loved to hear Billy singing on the radio. I can remember singing along to I Will, Like I've Never Been Gone and I'd Never Find Another you on Radio Luxembourg, never dreaming that one day I would be singing the same songs on stage," said Rob. 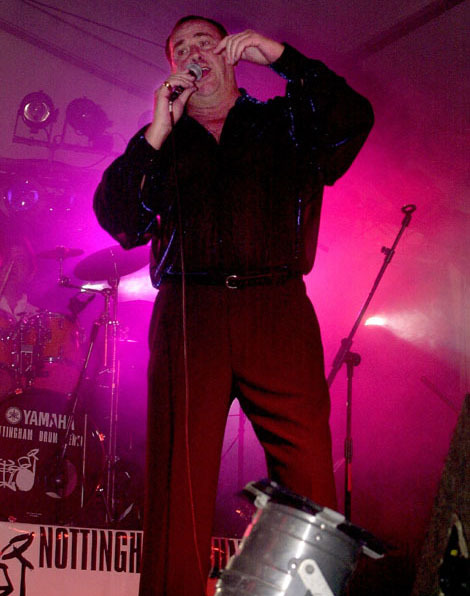 Clive, who is also a drummer, wanted to form a new band, and recruited Rob to front the Fury Sound, which now has a settled format of Ritchie Brookes (keyboards and musical director), Tony Turner (bass), Paul Newman (guitar) and Mac Poole on drums, replacing Clive, who is recovering from illness. Rob and the band headlined on the Friday night at Fury Fest 03 and Sunnyside 05, and also performed at the Ace Café and on a theatre tour. 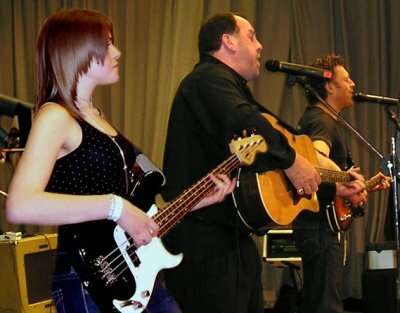 In October they headline at an Evesham charity night, and they are back to top the bill at Sunnyside 07 in March. Rob is also in demand with his solo tribute to Billy, and his 50s and 60s tribute. A new theatre tour in 2007 will be announced. The three featured tracks are from Rob's album First, Last And Always, which can be ordered from him on 02929 831907. Tommy, who died on 10 July 2006, was one of the great characters of the 60s scene, who remained a much-loved favourite for more than 40 years. recognisable trademark. No one else ever sounded like Tommy, and no one ever will. He was a porter in Covent Garden when conversations with his friend, singer/songwriter Barry Mason, who was fascinated with Tommy's voice, led to a recording of Tommy's favourite song, Ain't Misbehavin'. This held the number two spot for two weeks in July 1960, just before his 23rd birthday, and proved to be his only major hit. What he missed in registering hits was more than compensated by the affection with which he has always been held over four decades, supported by his manager and close friend, Dave Lodge. Four of Tommy's classic releases can be heard below. Albie, Billy's younger brother, was born on June 26 1943 in the Dingle district of Liverpool. He entered show business in 1962 under the stage name of Al Trent working with his band The Centremen. Two years later Liverpool comic Freddie Starr introduced Albie to the record producer Joe Meek, signed Albie and gave him the stage name Jason Eddie. His first release was in 1965 on the Parlophone label. On the A-side was a track entitled Whatcha Gonna Do Baby with the flip side entitled C'mon Baby. His second release, Singing The Blues, became a top 50 hit Jason in 1966. Jason had a UK tour with the Walker Brothers, The Troggs and The Mindbenders. Heart And Soul was released on the Tangerine label in 1969. Ill health forced Albie retirement from the music scene, but he returned in 1972 with his new band The Jason Eddie Sound and toured throughout the UK, appearing in big cabaret venues. After the band split in 1976, Jason began a solo career, performing his first Billy Fury tribute in 1989 for charity at The Montrose Club in Liverpool. Jason continues to do tribute shows in the name of his brother, winning new fans to the music. His shows have been noted in recent years for the superb production values, combined with a haunting, soulful presentation. 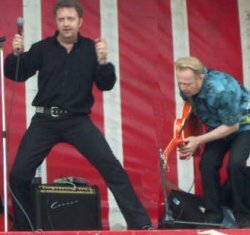 Although Albie is often mainly associated nowadays with his authentic Billy Fury tributes, his CD I Never Met Collette is a valuable reminder that he is also a superb performer in his own right. 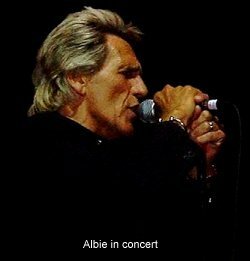 See also billyfury.com's page on Albie. Hear them as streaming audio. Helpless: His first recording for nearly 30 years. Dedicated to his dearly-loved late wife, Marie. 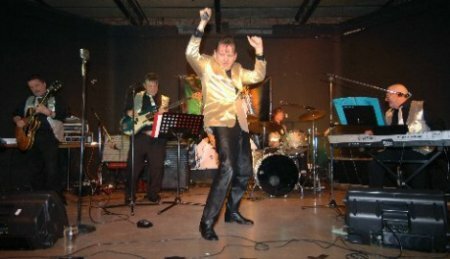 Operating from their base in the north-west, Colin Paul and The Persuaders have gathered a big fan base, who rate them as one of Britain's best live rock 'n' roll bands. Fury fans all know Colin as a dedicated, dynamic performer with an electrifying voice, backed by a superb set of musicians. And as anyone who has met Colin will tell you without prompting, he's also one of the nicest guys you will ever meet. One of his earliest recollections is hearing It's Not Unusual by Tom Jones. Then at eight, he heard Elvis's The Wonder Of You, and he was hooked. Colin heard Billy Fury singing Halfway To Paradise on Savile's Travels in the mid-70s, saw a picture of him with Elvis, and set out to find out more about him. At first, Colin used to record programmes on tape, which enabled him to hear more of Elvis's and Billy's work. In May 1988, he began making music professionally himself, when he formed the Stormbeats. "We had seven great years performing the music of the late 1950s and early 1960s," said Colin. "So popular were the Fury songs that we did a separate tribute shows under the name of The Fury Experience." The band met Jean and Albie, and Albie booked them several times to perform their own show, or to back him. The Stormbeats split in June 1995, but two months later, Colin formed The Persuaders. "We are still performing the hits of Billy Fury as well as other rock 'n' roll legends and our own material. "We have recorded several albums, including a tribute to Billy, and in August 2005 we recorded at the Sun Studios in Memphis, Tennessee. "Bearing in mind that we also work each year for the Presley estate, and over her alongside Billy's family, it just doesn't get any better than that." Colin said the great bonus with performing Billy Fury songs was that they were all singalong numbers. "As soon as the band strikes up you can see the audience singing along. "It's just a great feeling. Billy will never die, as each song is such a memory." The band were asked to perform at the Carousel Hotel, Blackpool, for the second Billy Fury weekend in 1992. "The rest is history. The weekends just got too big and we moved to the Metropole," said Colin. By coincidence, Colin had rheumatic fever as a seven-year-old and spent several months in hospital. For years, he knew no one else who had the complaint, until he learned that both Billy and Albie had been treated for rheumatic fever. One of my biggest disappointments was having to call off Fury Fest 04, as I was looking forward to seeing Colin and his superb band on stage in Leeds. We'll go some way towards making up for it at the Sunnyside in March. I Love How You Love Me: I just love this song. It's always been a favourite of mine. When I first heard Billy sing it, it just blew me away. It just goes to show that whatever Billy recorded, he could make it his own. Running Around: This song never fails to deliver. Billy rocks. Every time the Persuaders and I perform this song, it's a guaranteed floor-filler. The King Is Gone: A tale of two kings, Elvis and Billy. They may be gone, but we loved them through their music and that will live for ever. Without their songs to life us when we are down, to think of those we love, to dance to, or to remember the good times, the world would be a lonely place. Johnny Storme was born in 1957 on the Isle Of Wight, where he still lives, and his performances on the mainland have been far too rare. 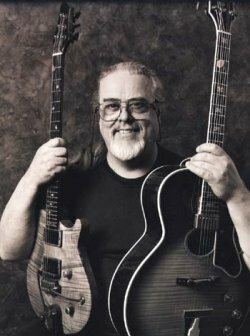 In the late 90s, John began learning the guitar, and started singing with the aid of a rhythm guitarist, a bass player and backing tracks - just for fun. In August 2001, John joined the Isle of Wight group The Invaders, and I had the pleasure of seeing their stunning act in Spring of 2002. Johnny regularly appears with the band at island venues. 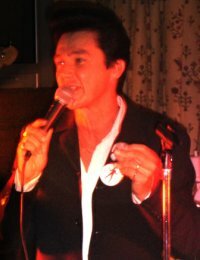 He was the first performer to record Billy's lost single, I Must Be Dreaming, after it was featured on billyfury.com and our Without You CD, for which he laid down some powerful tracks. John made a surprise appearance to open Fury Fest 03 in Newark, then he provided us with a very impressive guest spot at Back To The Sunnyside in Northampton in March 2005. Forget Him was the first song that I recorded in a studio at Southampton University. The backing was produced by David Twigg, who also sung backing vocals on the recording. His Dad, Allan played bass and is a great friend of mine. He was in a 70s group called Stevenson's Rocket and was in the charts. Don't ask me why, but I just needed to record it, and was gobsmacked when you added it to Paradise Place along with big name stars. Be Mine Tonight has always been a favourite of mine, so much so that I paid a lot of money to get the backing as close to the original as possible. Zoom Entertainments produced the recording and a big thank you went out to them and the session singers on the track for such a splendid job. I Miss You is one of those songs that can bring a tear to your eyes. At first I couldn't get past the first verse! I hope I have done the song justice as a lot of feeling went into the song and I didn't want it to sound quite like the Elvis version. I wanted to make it sound like it was from Johnny Storme. Many of us particularly admire John for his talent in infusing every song he tackles with an extraordinary sensitivity. Listen to these three tracks, and learn why we consider John to be so special. Laura is from Northampton and was 18 in January. 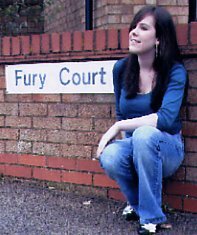 She has been familiar to Fury fans for several years, however, as she developed an interest in Billy's music through her manager, Kevin Summerfield. As well as a terrific voice, she has a poise and confidence that belie her years, and those who have met will know that she's a genuinely nice young lady. She has her feet firmly on the ground - she's studying A-levels at school in Wellingborough, and she aims to qualify as a primary school teacher. Laura also wants to make it as a singer, but she is a realist and knows that while her ability has given her a flying start, there's hard work ahead. Laura loves 60s music and the lyrics to Legends Never Die reflect Laura's reaction to being shown video clips of Billy for the first time. She has appeared at Billy gigs, notably The Empress Ballroom, Blackpool, after the statue unveiling at the Philharmonic Hall, Liverpool and at Fury Fest 03. She is also a featured artist at Back To The Sunnyside in Northampton on March 19. The three tracks that showcase Laura's talent are very different. Only 16: Having spent an enjoyable weekend in Liverpool for the statue unveiling, she was deeply affected by the murder of a 16-year-old boy - a victim of a drugs turf war in the city. This is a rewritten version of Craig Doulas's Only 16. Baby How I Cried: This is a real knockout - a superb new version of a Fury track. Legends Never Die: The updated version of the song that first helped to bring Laura to our attention. Baby How I Cried and Legends Never Die initial production and keyboards by Matt Condon/guitar by Mick McNulty/all vocals and mixing by Neil Haynes, Parlour Studio.